I absolutely adore -- flat out love, have a total obsession and admiration for -- hero stories. I love what they embody: the underdog, the average Joe fighting against a terrible evil, standing up against oppression and tyranny. It's such an ancient kind of story, and yet it's one that is modeled over and over again, and loved over and over again, because it's a tale that, no matter the circumstances, appeals to our humanity. It quickens the breath, stimulates the heart, rouses the emotions. If I have a go-to story, it's a hero's journey. The Lightning Thief is the perfect kind of hero's journey to quench my thirst. It features a young but spirited main character, Percy, who, for Gods' sake, just wants a normal life. And yet, he's constantly getting into trouble: being thrown around every public and private school in Manhattan, leaving mysterious happenings in his wake. But he doesn't know how that stuff happens. He just wants to be a normal kid. If it was hard being normal before, try finding out you're the son of a god. So here we have the prime candidate for a hero, now he just needs to be outfitted with a few things: two best friends for starters, a super smart (if slightly annoying) daughter of Athena and a nervous (if well meaning) guy who happens to be hiding goat hooves in his sneakers. But you can't just have a golden trio and not give them a place to call home. The answer to that: Camp Half-Blood, a place for people like Percy to not just be safe from the dangers of the outside world, but to thrive by learning how to harness their powers. Of course, that's if you know which god happened to pass along those "powers." Being claimed by your godly parent is great, unless it marks you as the most powerful demigod to exist. If you do happen to be the most powerful demigod to exist, unfortunately that doesn't mean you get to kick your feet up on the beach with a colorful, umbrella-type drink. It means you're probably going on a quest, which you may not return from. This quest will contain all kinds of magical and otherworldly obstacles: an ancient lady with snakes for hair, a chihuahua that breathes fire and asks questions later, and maybe a god of war or two. There is no cashing in accumulated vacation time when you're a demigod out to stop an evil force more powerful than the gods themselves. 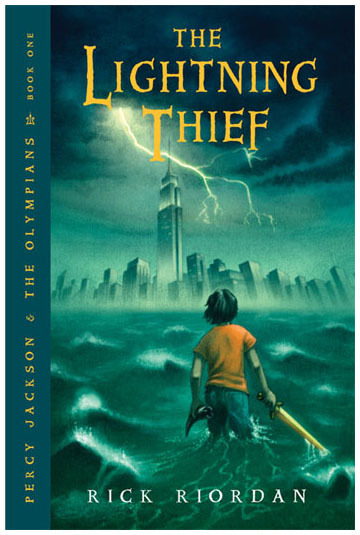 Percy's story begins with The Lightning Thief, which launches him on a epic journey that will test his resolve, his instincts, and his strength. Luckily, he isn't alone while he's off to battle evil. And while some of those newfound friends may really be enemies in disguise, he has finally found a place where he can be himself. The Lightning Thief is my answer to the perfect hero's journey: massively entertaining, inspiring, and enjoyable, it is a story for all ages and one that I would recommend to anyone over and over again. "What if it lines up like it did in the Trojan War ... Athena versus Poseidon?" "I don't know. But I just know that I'll be fighting next to you." "Because you're my friend, Seaweed Brain. Any more stupid questions?" In a way, it's nice to know there are Greek gods out there, because you have somebody to blame when things to wrong. For instance, when you're walking away from a bus that's just been attacked by monster hags and blown up by lightning, and it's raining on top of everything else, most people might think that's just really bad luck; when you're a half-blood, you understand that some divine force really is trying to mess up your day. The wood nymph instructors left me in the dust. They told me not to worry about it. They'd had centuries of practice running away from lovesick gods. But still, it was a little humiliating to be slower than a tree.